We proudly supported the 34th BBC Proms Concert and the Last Night of the Proms in the summer 2013! 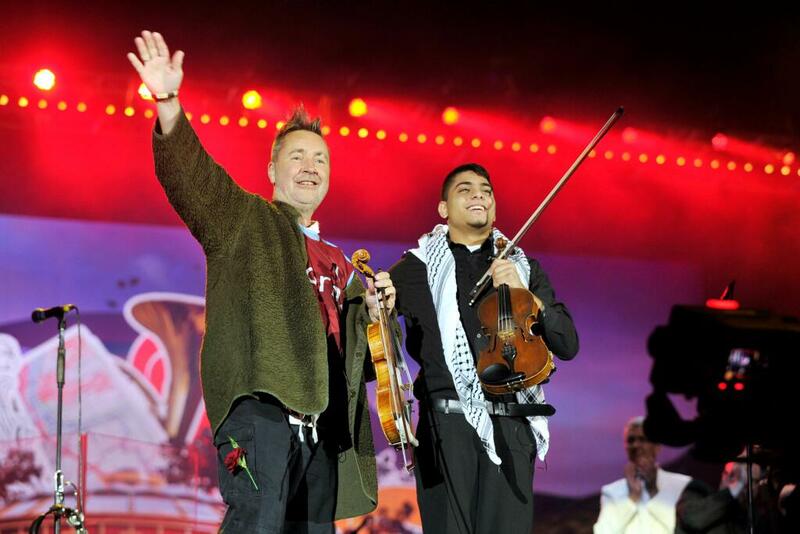 In the summer of 2012, a partnership was born when a group of young string players performed with Nigel Kennedy at the Yabous Festival in East Jerusalem. 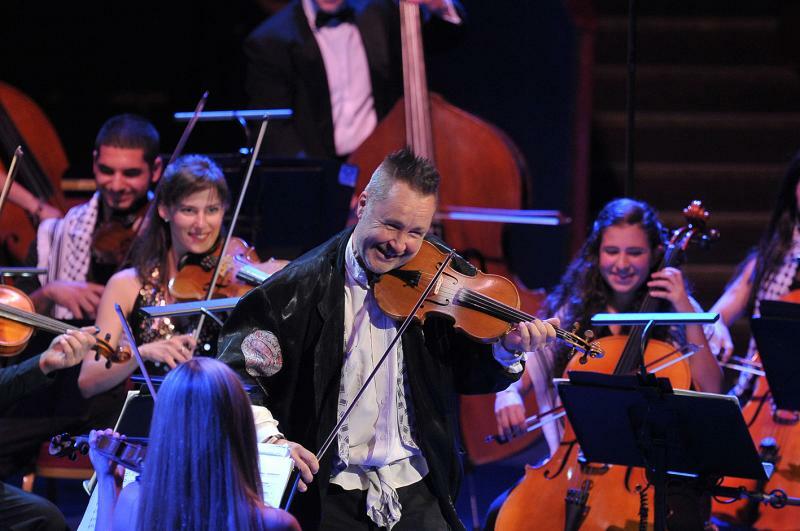 Nigel Kennedy, impressed by the young musicians’ ”fantastic talent”, he led them the following year to the steps of the Royal Albert Hall alongside members of his Orchestra of Life, for the BBC Proms Concert on 8 August 2013. The big moment came when the seventeen members of the Palestine Strings, aged from 12 to 23 years old, walked on stage to a warm welcome and acclaim from a packed audience of over 5,500 and Kennedy performed with them Vivaldi’s Four seasons. 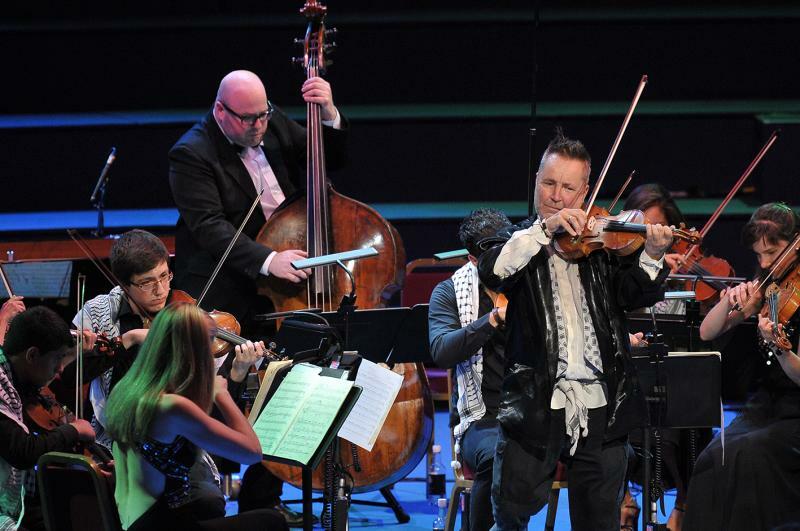 This moment was made possible through the intense period of logistical preparations from the Edward Said National Conservatory of Music (ESNCM), the BBC, Nigel Kennedy and his team, and it was facilitated and sponsored by the FRIENDS of the ESNCM UK. At this summer performance, Vivaldi’s Four Seasons was revitalised and coloured in a manner previously unheard, fused with improvisations rooted in both Arabic and Western music. It was a fusion of cultures, making it more exciting and dynamic and certainly very interesting. The young musicians, which are schooled in both music cultures, were impressively attentive to Nigel’s beat, ”transporting the music of 17th Century Venice 1500 miles East”, as the TIMES documented. 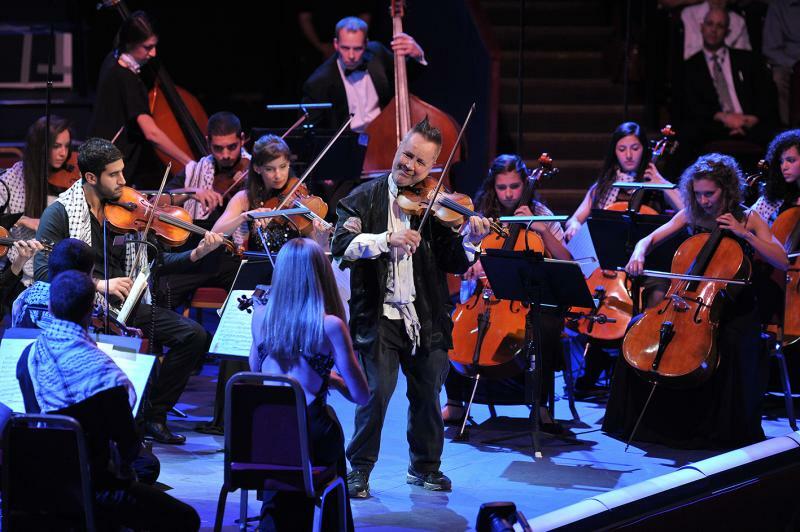 Further to the above, Nigel Kennedy invited Mostafa Saad, a 15-year old member of the orchestra, to join him at the Last Night of the Proms closing concert in Hyde Park, where both played Nigel’s composition ”Melody in the Wind” in front of a mesmerized, ecstatic audience. According to the Telegraph, their performance “was the highlight of the evening”! The Friends UK also funded the participation of Mostafa at this final Proms concert. For the young performers these concerts represented an unparalleled opportunity to expose themselves to the British and international audience and to showcase what young Palestinians can achieve. 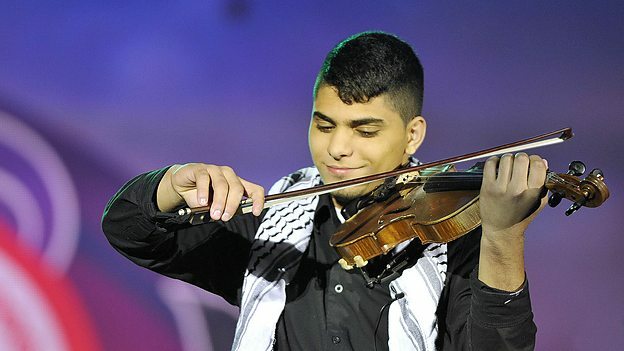 “We are musicians first and foremost, but we are also performing as Palestine,” says Layth Hanbali, a Palestine Strings member. This major event was undoubtedly an important happening in ESNCM’s life. It was a significant professional achievement, reflecting on the ESNCM’s music training program and an indicator of the quality of its teachers and the skills and talents of its students. The Friends UK are proud to have been an active partner in the this project which marked the official take off of the newly established Charity and are grateful for the fine cooperation established with the BBC and the ESNCM in making of this event a big success.